When you click a search result in Spotlight, the item will open with its default program. Hold down âŒ˜ + âŒ¥ to reveal the file’s path below the preview box appearing to the left of the search result list. âŒ˜ + click, or âŒ˜ + âŽ, to reveal the file in the Finder. Did you ever get that annoying problem that in your “Open With” menu the same app shows multiple times? Fortunately, this is easy to fix. Just open up Terminal and paste in the following lines (all at once) to fix the problem! Cause of the problem: When you delete an application, its entry in the “Open With” menu is not deleted. This also applies to app updates, where the old version of the app is deleted and replaced by a new one (which gets its own menu entry). The problem probably only occurs for non-Mac App Store apps. Today I needed to resend an email I sent a day before – using Outlook 2011 for Mac. It took a while to compose this email so I got quite scared when I looked at my “Sent Items” folder and the mail wasn’t there. My situation: I’m using an Exchange mailbox is primary mailbox and have a POP3 account for my university email address. The latter I only use to send emails (as the actual university email address is just a forwarding). If you have a similar setup and problem, read on. On Outlook for Windows, sending an email through this email address/account, moves the sent email to the main “Sent Items” folder – which at the same time is the “Sent Items” folder for my Exchange mailbox. Option to show or hide the "On my computer" folder(s). Now the “On my computer” folder showed up in my “Sent Items” folder and there my mails were. Now, the quest at hand was: How do I get my sent mails into my “Sent Items” Exchange folder. The solution: Create a rule for this. So, I went to “Settings” –> “Rules” and created a new rule in the “Outgoing” rules section. Leave the rest as it is and hit “OK”. Now try to send an email from your POP3 account and, voilÃ , the email you just sent should appear in your Exchange’s “Sent Items” folder. Java is open-source, fortunately. Accessing its source code is, unfortunately, not so intuitive on Mac OS X Lion when using Eclipse. This article will guide you through the steps required to be able to view Java’s source code in Eclipse. Assigning a DNS name to a virtual machine can be a convenient thing. Do this is not very complicated, it requires some technical skill though. 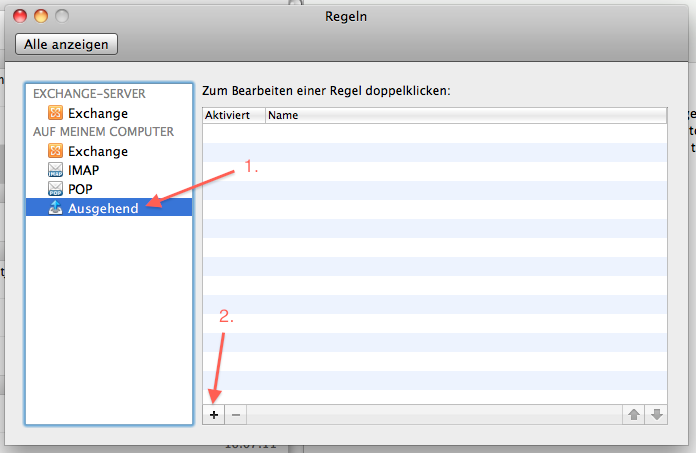 This tutorial shows how to do this with a Ubuntu 11.10 Linux server running under Parallels Desktop 7 on Mac OS X Lion. The basic principals described in this article work as well for any other combination, but that’s beyond this article (and that’s where your technical skill comes into play).